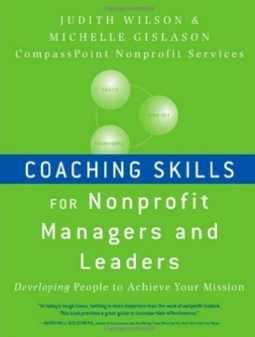 Based on Judith Wilson and CompassPoint’s popular coaching skills workshop, this practical guide provides nonprofit managers with an understanding of why and how to coach, how to initiate coaching in specific situations, how to make coaching really work, and how to refine coaching for long-term success. The first coaching book focused on nonprofit managers, this book is for those who manage others in any nonprofit setting and are seeking tools to engage, support, and develop their staff. Read more and order your copy now. For bulk sales, contact specialsales@wiley.com. For more information contact Dora Ajca at DoraA@compasspoint.org or 415.541.9000x338. Coaching Skills for Nonprofit Managers and Leaders can be used by the coaching novice as a thorough topical overview or by those more experienced with coaching as a quick reference or refresher. Learn why coaching is emerging as a critical leadership competency of top managers.